Civil society organizations (CSOs) attempt to induce corporations to behave in more socially responsible ways, with a view to raising labour standards. A broader way of conceptualizing their efforts to influence the policies and practices of employers is desirable, one centred upon the concept of civil governance. This recognizes that CSOs not only attempt to shape the behaviour of employers through the forging of direct, collaborative relationships, but also try to do so indirectly, with interactions of various kinds with the state being integral. Drawing on evidence derived from UK-based CSOs involved in work and employment relations, four types of civil governance are identified and characterized. By elaborating the concept of civil governance, and demonstrating how different types of civil governance operate, the research extends our knowledge and understanding of how CSOs, as increasingly prominent actors in the field of work and employment relations, operate within, and contribute to, systems of labour governance. The research on which this paper is based was funded by the Nuffield Foundation and Kingston University. We thank the reviewers for their extensive comments on earlier versions of the paper, their helpful suggestions and their encouragement. Knudsen, J. S., & Moon, J. (2013). 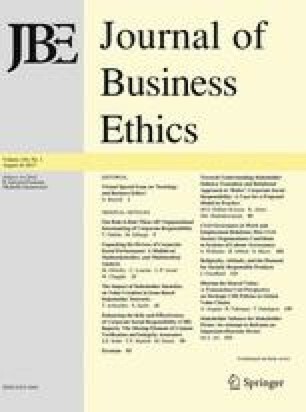 The regulatory configurations of political CSR: International interactions of business, civil society and government. Civil Society and Government Working Paper. Retrieved from http://papers.ssrn.com/sol3/papers.cfm?abstract_id=2234444.